Day 9: I have only one sibling and that is my sister, Kelly. She's 4 years older but the age gap never was a problem. We were very close growing up, confiding in each other, having mutual friends. We're night and day though. I think that's why our relationship is so unique. We have so many different interests but they make us strong as individuals. We each bring something to the table, so to speak. As all families go through their own struggles our family was no different. Together we have all overcame some pretty crazy obstacles. I'm proud of my family, but most of all my sister. She amazes me. One thing about her that stands out to all is her talent. In Elementary my parents bought her a keyboard. There was no rhyme or reason, they just got her one hoping that she would enjoy playing. They signed her up for lessons and so she went for years to the same instructor. Kelly's talent amazes me, that's clear.. but what leaves me speechless is how she can hear something and immediately begin playing it with only missing a few keys. From the keyboard she moved onto the piano. Then as the years approached that joining band was an option she thought 'Why Not' and picked up a Clarinet. Over the years, my sister taught herself to play almost every instrument... the guitar, the baritone, the flute.. etc etc.. She's remarkable! I was browsing all of your lovely blogs and one picture stood out. My wonderful friend, Danielle at Positively Positive has her own Etsy Shop. I began peaking around at her creations and I was in awe. 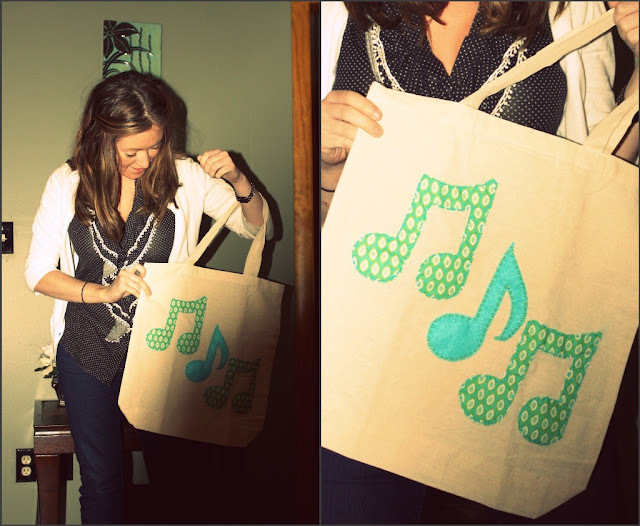 Immediately, I noticed the cute totebag with the musical notes. Out loud in my living room with the laptop on my lap.. I said "Kelly!" The puppy looked up at me confused. I said out loud again "Kelly!.. I have to get that for her, she'll love it!".. and so I did.